Ravi Shastri Clarified All the Questions. In the 3rd match of the ODI series with England, a video shows MS Dhoni asking the match ball from the umpires. In the Video Mahendra Singh Dhoni taking the match ball from the Umpire at Headingley, Leeds. Which got viral on the internet. The question was all over the social media and the internet asking Is Dhoni retiring ? was the talking point. 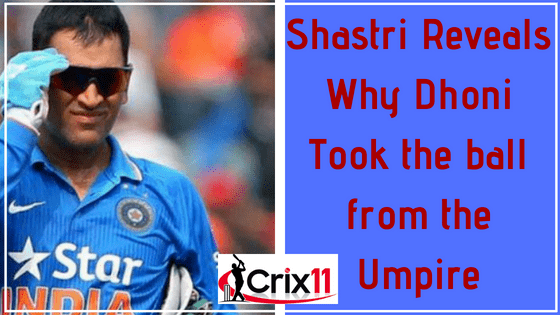 Despite India lost the match he asked the match ball from the umpire, which made people wonder and fans were eager to know the truth behind this question. Dhoni asked for the ball from the match umpire Bruce Oxenford from Australia and Michael Gough from England when the team was walking back to the pavilion. On Wednesday, July 18th Ravi Shastri the team India coach dismissed all speculation on the retirement of Dhoni. Shastri says “ MS. Dhoni wanted to show the ball to Bharat Arun. He wanted to show the wear and tear of the ball to him that the ball has endured, to get an idea about the kind of condition it was. Speculation on social media was buzzing that the greatest finisher will soon say a final goodbye to all format of the game. While adding Ravi Shastri said that rubbish he is not going anywhere. In the 2nd ODI match with England, there was a lot of criticism about Dhoni with fans booing during the chase, when he scored 37 for 59 balls at Lords. Shastri added saying “ If criticism comes in Dhoni’s way, he might as well endure it. But that wouldn’t make him any less important than he is right now, as we know what he brings out to the squad. “ all the clamour is nonsense. He just wants to show the ball to the bowling coach Mr Arun to just have a look at the ball after close to 45 overs”. This is just a happy movement for Dhoni’s fans, as he is not going anywhere. For more updates on cricket news click here.